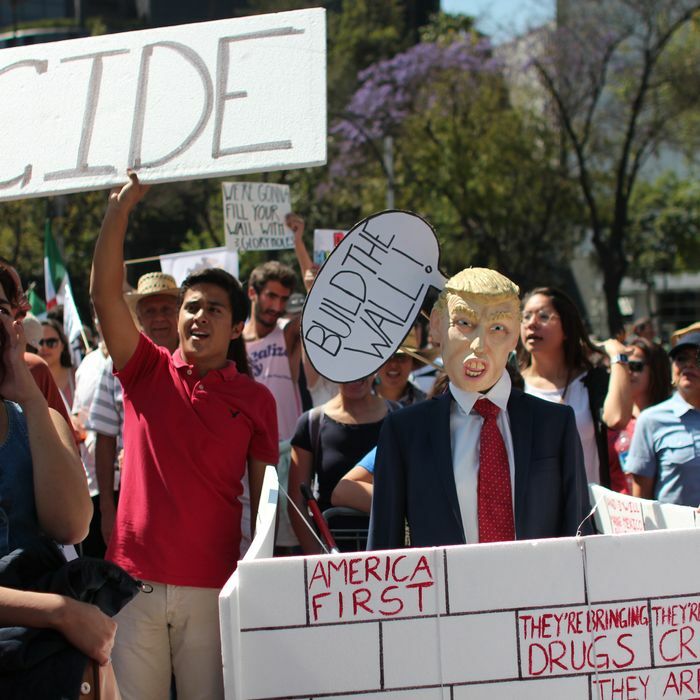 People protest Trump’s policies on February 12, 2017, in Mexico City. The Trump administration’s timing of its immigration directives is a sign of either the disorganization within the White House or a purposeful effort to provoke Mexican officials. Last month, Trump unveiled his executive orders on immigration and a border wall on the same day top Mexican officials met with Trump aides in Washington to lay the groundwork for Mexican president Enrique Peña Nieto’s visit to the White House the following week. After bickering with President Trump on Twitter, President Peña Nieto canceled the meeting. Now the Department of Homeland Security’s release of “guidance memos” elaborating on how the executive orders should be carried out has jeopardized another attempt to mend U.S.-Mexico relations. The memos were released on the eve of U.S. Secretary of State Rex Tillerson and Homeland Security Secretary John Kelly’s visit to Mexico City, and Politico reports that Mexican officials were scrambling to collect more information from the U.S. government on Tuesday. Whatever the aim, the memos likely made that mission more difficult. While Tillerson and Kelly have been far less combative than Trump in their stance toward Mexico, the Associated Press reports that Mexicans were already questioning the point of continuing discussions with an administration that keeps talking about deportations, taking jobs from Mexicans, and forcing Mexico to pay for a wall. Earlier this month, 20,000 people marched in Mexico City to protest Trump’s policies. Ahead of this week’s visit, some have urged President Peña Nieto to take a tougher stance against the U.S. Writing in the newspaper Reforma, journalist Carmen Aristegui said Peña Nieto should set new ground rules before talks with the U.S. proceed. “Instead of welcoming Tillerson and Kelly next week as if nothing had happened, the Peña administration should say that there is no basis to negotiate on any topic at all, until the executive order to build this absurd and offensive wall is withdrawn, and our countrymen are no longer criminalized or prosecuted,” she wrote. Under a grab bag of different programs, Washington has provided billions of dollars in assistance to Mexico and those Central American countries to stop their citizens from reaching the United States. Mexico has responded, dramatically stepping up its detentions and deportations, with removals doubling from 2013 to 2016, primarily of Central Americans. And more people are deciding to stay in Mexico and apply for refugee status there, rather than trying to cross into the United States. Trump’s latest orders call for auditing “all sources of direct or indirect” federal aid to Mexico, hinting at cuts. A provision unveiled on Tuesday involves deporting undocumented immigrants to the country where they crossed the border, rather than their country of origin, as their case is processed in the U.S. However, Mexico could not be forced to accept foreign migrants, and the country could exacerbate problems for the U.S. if it suspends its efforts to prevent Central Americans from heading north.